Google has updated its platform distribution numbers today, and Marshmallow has taken a nice jump upward. The latest version of Android is now over 10% of active devices. Just in time for Android N to show up, right? Then there's Froyo, which stubbornly hangs on at 0.1% of the market. Only Android 5.1 and 6.0 ticked upward this month. It was actually a rather large increase for 5.1 at 0.6%, bringing it to an even 20%. It has been stagnant or increasing only slightly in the last few updates. Everything else has been decreasing at roughly the same sub-1% pace in recent months. At this rate, Gingerbread should be dead in about a decade. Marshmallow's share has more than doubled since April, which is good news. Most new phones come with Marshmallow now, so it's no surprise it's gaining faster. However, if we compare this to Lollipop's rollout last year, 6.0 is running behind. 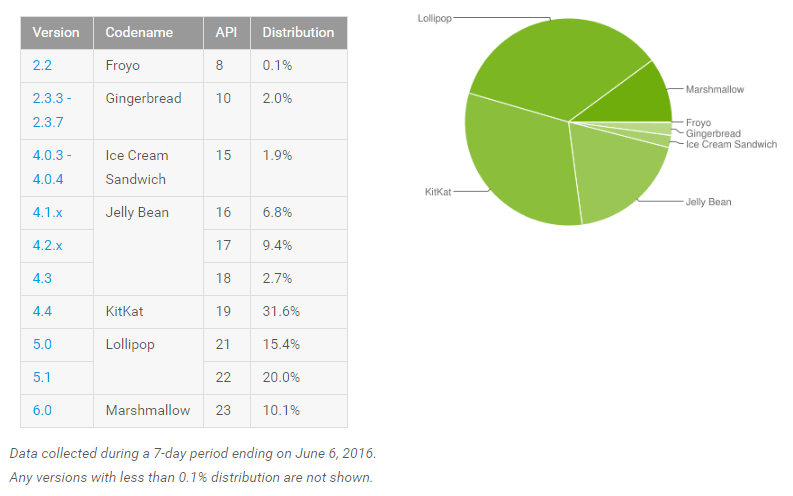 Lollipop (5.0 and 5.1) were over 12% in June 2015.